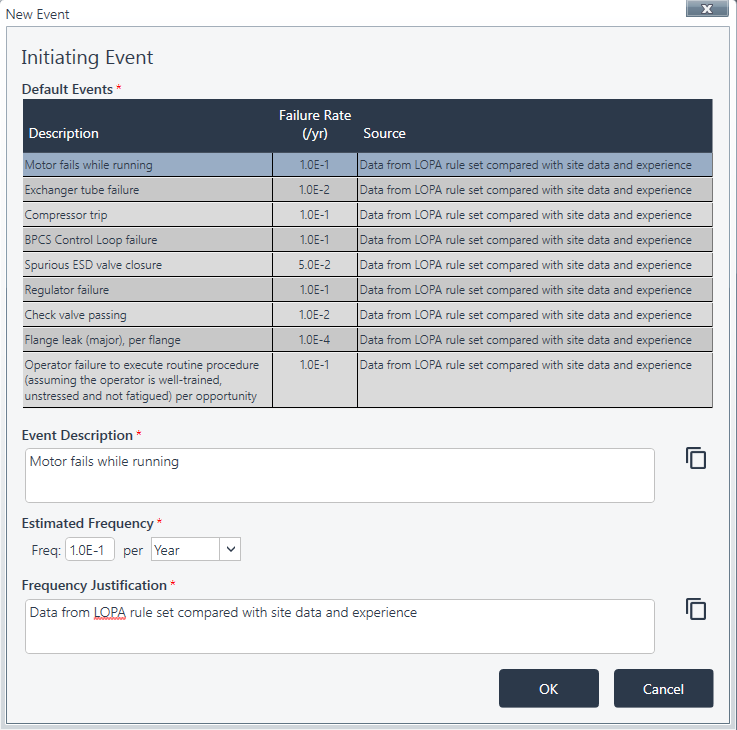 Initiating Events can be added by clicking on the required Hazard ->SIL Determination -> LOPA -> Initiating Events. An initiating event is a potential cause of the specified Hazard, which ultimately can cause a demand on the SIF for which the SIL Target is being set. Note – It is only possible to configure Initiating Events for Low Demand SIFs. A default Initiating Event is shown if in Continuous Mode to allow the adding of IPLs and Conditional Modifiers. The Add Initiating Event window allows the selection of a default Initiating Events or to create a new Initiating Event altogether. The defaults are provided as a guide and can be modified in each use depending on the study. When setting a Target Frequency you can select the time unit, which converts the frequency to “per years”. When selecting “Operator failure” (Human Error) from the defaults a Probability Of Error field is shown.